Connectify - blow your WIndows 7 connection wide open! 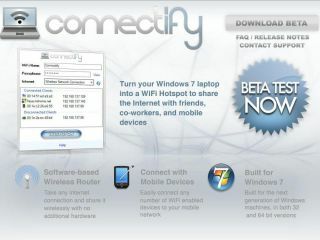 A group of developers has exploited a hidden element of Windows 7 to turn any PC running the OS into a Wi-Fi hotspot with an application called Connectify. Nomadio, consultants for military networks, used some software (known as Virtual Wi-Fi) buried within the OS, left over from a MS research group project, but apparently discontinued in 2006, according to TechWorld. "A year ago, Microsoft talked a lot about this as a big feature in Windows 7. But driver support didn't get finished. The low-level code is in there, but the driver-level stuff isn't," said Alex Gizis, CEO of Nomadio. Nomadio used its software from its work into networking to complete the necessary functions, creating the new Connectify software. The possibilities of this free (but beta) download are pretty interesting - it means you can pay for one connection but stream it out to multiple devices (or friends if you're feeling like helping out freeloaders). However, Gizis has stated that he expects the software to eventually carry a cost when released as a full version in a few weeks, with a free, ad-funded option possibly available as well. Either way - if you're one of those that has multiple Wi-Fi devices but can't afford to pay time and again every time you're in Starbucks, perhaps this is something you should check out.